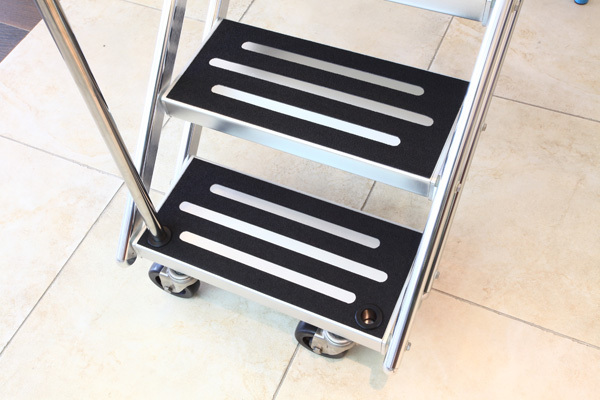 Premium Tide Rider Boarding Stairs are available in multiple sizes, styles and configurations. Durable and stylish, Tide Rider Stairs come with wheels for easy use, and fold up for quick and efficient storage. 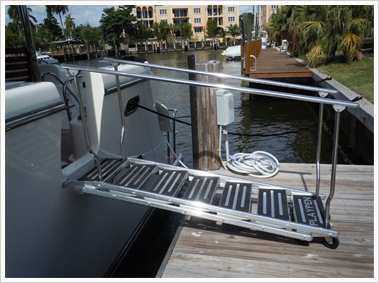 Handrails on one or both sides of the ladder assist with boarding so everyone in the family or party can safely board the boat. Standard stairs have 6 to 9 rungs or stairs and a walkway that is 19 inches in width. 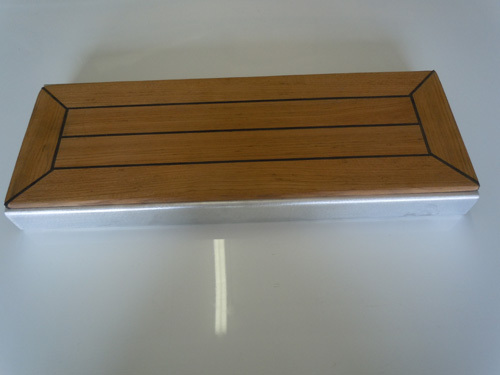 However, other sizes and configurations are available and New Wave can also customize a Boarding Stair using various materials to meet your individual needs. Tide Rider Stairs from New Wave are light enough in weight that one person can easily handle them. Even with this lightweight Boarding Stair construction, Tide Rider stairs are still sturdy enough for secure use in all weather conditions. 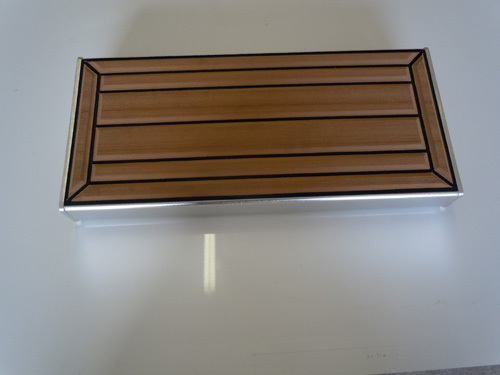 This is because New Wave offers only the best materials and construction methods available. 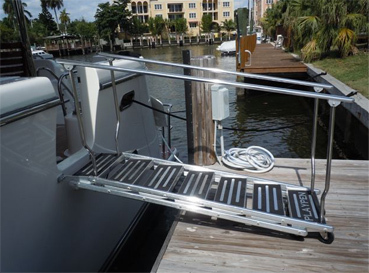 Good for commercial or recreational uses; Tide Rider Stairs are an excellent, functional accessory for boats of all shapes and sizes! 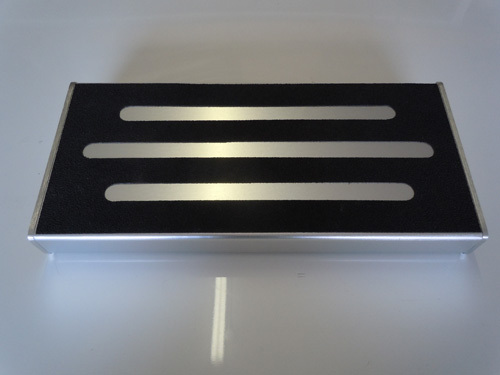 * Stair Width: All Standard Stairs have 19″ walkway and are 21″ overall. I would like to thank Paul Noel and his team at New Wave Fabrication. 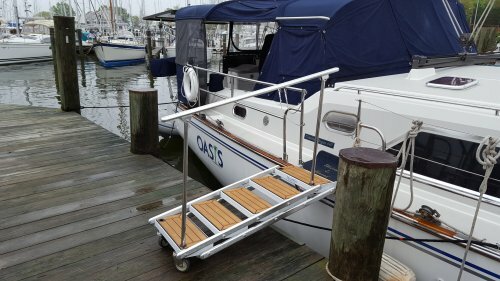 I am a new Captain here in Florida, and first contacted another company to complete a gangway / stair to the Viking 65 Sports Crusier I run. I could not get it to happen. Could not even get someone to come and quote the project after multiple calls. After a recommendation from a local Captain I made a call to New Wave. They were there to quote the following day, and completed the project in a very timely manner, and as quoted. 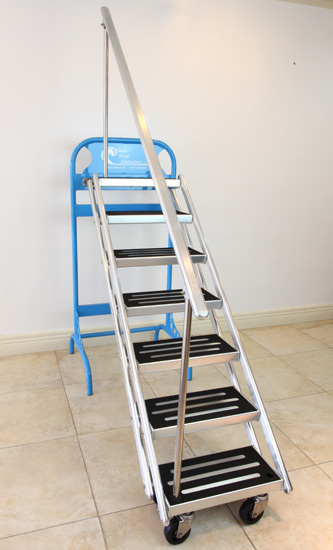 The stairway is a superior product to those I have seen on the market. Thanks Paul, and thanks New Wave Fabrication. The detail and craftsmanship on your eight step stairs you installed is unbelievable. The delron guides installed on the bottom rails was great, this allows our crew to stow our stairs without damaging the boat and stair. The boat name on the bottom step also looks great.